Strategic Files: Fated Future: On Ethno-Terrorism, Politics and the Future of Kenya. A government maintains its legitimacy by upholding and safeguarding the vital interests of its citizenry. Also, how the state interacts with the society determines and charts the national, strategic, and political culture. A state that safeguards the myopic interests of its political elite to the detriment of the general society is exercising tyranny; while a state that rules by popular consensus, and also safeguards the vital interests of its citizenry is considered a democracy. Provision of security - both at the national level, as well as the individual level - is the greatest determinant of the integrity of any sovereign nation; failure to which, the nation is considered a failed state. Kenya is presently a fragile state plagued with economic decline, group grievances, brain drain, demographic pressures, skewed socio-economic development, unsettled internally displaced people, factionalized elite, weakened state legitimacy, erosion of the rule of law, and a deeply compromised and highly tribalized security apparatus. Though the government has precariously endeavored to provide security at the national level; poor provision of security at the individual level has led to the emergence of armed groups and vigilantes. Though none of these armed groups compete with the state for national power, they have nonetheless been able to supplant state authority in their locales. Moreover, these armed groups have been, or are, predominantly tribally-based – with some receiving state-backing. They have therefore been central in fomenting ethno-terrorism. At present, Kenya is ruled by a multi-ethnic alliance that is non-integrative in nature. This means that the ruling alliance is structured to deny political goods to groups (or entities) not allied to the regime. Likewise, political economists have observed that the present government has consistently negated efforts to bridge existing ethnic cleavages, thus revealing the alliance to be an alliance of ethnic convenience. A discomforting feature of tribal-based governments is their promotion and utilization of ethno-terrorism to shield state power from competitors, in addition to protecting narrow ethnic interests at the expense of national interests. During Moi’s Regime, Kalenjin terrorists were used to evict and harass opposition-allied communities in 1992, 1994 and 1997. Besides, Moi’s government was mostly staffed by semi-illiterates, most of them from the Kalenjin community; and a culture of anti-intellectualism was entrenched in government and state organs. Consequently, the economy was run down by the ill-educated workforce, and Moi’s regime ended up pauperizing an entire generation of Kenyans. Furthermore, mediocrity was deeply entrenched in the national-political life, as well as in the administrative structure of the nation. Unsurprisingly, Kenyan politics is still tribal-based. This is due to lack of competing ideologies – a result of anti-intellectualism rooted by Moi who also contaminated, and eventually ended up infecting, the national body politic with the recalcitrant disease of tribal clashes. A similar situation is also manifesting itself in the present Kenyatta-Ruto Administration, with Kenyatta unabashedly promoting tribalism, in addition to fostering Kikuyu supremacy, under the guise of nurturing patriotism. This has gravitated Kenya towards civil strife. All the same, ethno-terrorism has a history linked to the ruling regimes in Kenya. The ascendancy of the Kikuyu to dominance over the political landscape of Kenya is pillared on their disproportionate politicization and good education, which is coupled with their “superior abilities in government”. Kenyatta was the best protector of British interests, rather than the most potent threat to them, as the accepted wisdom had been in London and in the offices of the colonial government in Nairobi. Kenyatta was, MacDonald thought, ‘the most shrewd, authoritative and sagacious leader available to Kenya’. There were, by contrast, ‘far fewer good brains in the K.A.D.U. Party’ and its leader Ronald Ngala was ‘rather second-rate’. The last governor thought it critical that Kikuyu supporters of KANU should hold the upper hand after independence. While Kenyatta was a critical force in the efforts to push the British out of Kenya, the cause of building a coherent sense of a Kenyan nation was weakened by his own skepticism about the project. He thought ethnic unity to be the first priority of any Kenyan politician; only then could attention turn to building the nation. On the eve of Independence, Kenya had a devolved constitution, which it transitioned with into Independence, whereupon Kenyatta and like-minded cadre struggled unremittingly to destroy devolution and centralize the management of national resources. The desire to destroy devolution (or Majimboism as it was referred then) was centered on valid uncertainties brought about by the dynamics of devolution, which tended to favor militant tribalism, ethnic strife, and forced population transfers; as well as regionalization of state resources, which altogether posed an existential threat to the infant independent Republic. Kenyatta’s strategy to destroy Majimboism was quite simple, but remarkably brilliant - the regional assemblies were starved of finances and revenues, hence bankrupting them and forcing them to seek an acceptable accommodation with Kenyatta’s government. 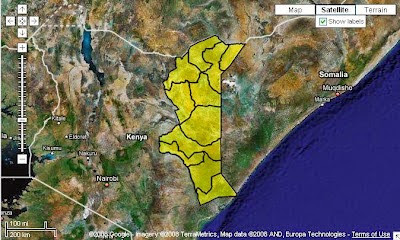 Kenyatta used this opportunity to force a merger between KADU (Kenya African Democratic Union) and KANU (Kenya African National Union), thus ushering in a unitary state ruled by a centralized government. Jomo Kenyatta’s strategy is furtively being replicated by his son, Uhuru Kenyatta, who serves as the present president of Kenya. Uhuru desires to scuttle devolution and re-impose a powerful Centralized government. In an effort to stabilize the nation as well as curtail political opposition, Kenyatta centralized state powers and imposed one-party-rule over the nation. Initially, the ruling party was dominated by two communities, the Kikuyu and the Luo; but due to ideological polarization between the two camps within the party, the Luos were edged out in favor of the Kikuyu, who consequently ascended to a position of total dominance in the ruling Party, and in extension, to dominance over the national affairs of Kenya. Likewise, along the Coastal Strip, an indisposed Mijikenda political class clashed with the Arab bloc, which strove to revert the area back to the suzerainty of the Sultanate of Zanzibar. Also, the Mijikenda elite clashed with the central government because they wanted a devolved system of governance . The post-independence political dynamics were at odds with the expectations of the political class in the Coast region, and they ultimately lost the political battles as Kenyatta consolidated his one-party rule over a unitary state, which also allowed him to relocate masses of landless Kikuyus, via land settlement schemes, to Coastal Kenya, with Mpeketoni being one of the most notable successes. With the resettlement of upcountry people in the Coast, group grievances emerged and have festered ever since, with Al-Shabaab using such grievances to its advantages - especially when it launched a month long terror campaign in Lamu county, which is located in North Coast. Nonetheless, the Kikuyu establishment still dominates national power, and they have been able to successfully project this power to their advantage, particularly in relation to detoxifying anti-Kikuyu sentiments. Likewise, the Kikuyu political establishment has shown readiness to use existing instruments of power to protect its privileges, as well as starve off persecutions. During Moi’s regime, the Kikuyu people were subjected to pernicious persecutions, with state-backed terrorism mortifying itself as Kalenjin Ethno-terrorism. The Kalenjin community has been, and still is, the main ethnic group linked to ethno-terrorism – chiefly due to its use of threats of communal violence, and instigation of tribal clashes in the Rift Valley Region, in attempts to influence both the political and socio-economic processes in the region. Kalenjin ethno-terrorism has its roots in the Moi Regime. It was borne during the formative years of Multi-party politics in Kenya, in the late 1980s and the early 1990s. This reflected evolution of domestic politics. According to Bethwell Ogot, the waning of leftist politics in the Post-Cold War world – under pressure from Neoliberalism - and demands for greater political space within Kenya ultimately shifted the focus of grievances in Kenya from socio-economic redistribution of resources to group-identity politics. Ogot’s assessment is correct; and presently, Kenya can be considered to be in a state of political hypostasis caused by deep entrenchment of group-identity (principally tribal and religious) politics in the national, strategic, and political space. It was in this environment that Kenya witnessed its first province-wide tribal clashes in the early 1990s. With the repeal of the constitution in 1991 to allow for multi-party politics, along with the demographic explosion that saw the ranks of the disaffected swell; Moi’s government was hard pressed to find an alternative solution to what was widely expected to be an end of Moi’s regime. The regime conceived a sinister plot to punish political opponents and non-pliable constituencies by subjecting them to extreme state-sponsored violence, which was meted out by ethno-terrorists, most of whom described themselves as Kalenjin Warriors. Why did politics suddenly turn toxic in 1992? The answer lies in the politicization of both ethnic grievances and tribal identity. Walter Oyugi correctly observed that “ethnicity per se, in the absence of its politicization, does not cause conflict” ; and as such, acrid politicsis the most integral component of ethnic conflicts. In 1991, Moi’s regime actively invoked, sponsored, supported, and disseminated tribal ideologies. This was done to consolidate its core support base in Rift Valley, as well as victimize ethnic groups perceived to supportive of the political opposition. A parliamentary committee in September 1992 confirmed the existence of Kalenjin Warriors who were being trained and armed by KANU partisans and top-ranking government officials for the sole purpose of evicting opposition-affiliated communities from the Rift Valley. In December 1992, elections were held, and though marred by massive irregularities (including the denial of identification cards and voters card to many young Kenyans perceived to belong to opposition-allied communities); Moi was controversially declared the winner and sworn in as president for another term. Coincidentally, tribal clashes erupted on the eve of the December 1992 elections, when hordes of Kalenjin warriors armed with bows and arrows invaded farms owned by Kikuyus, Luhyas and Luos in the Rift Valley region, where they looted assets, killed people and burned farmlands. Moi’s regime characterized the clashes as spontaneous, though reports showed a remarkable degree of organization and similarity in modus operandi, thus revealing that the violence was premeditated. Moi’s government was also disconcertingly hostile to anyone who sought to aid the people affected by the tribal clashes, with government officials threatening aid agencies and church organizations that provided relief to the displaced communities. Poignantly, the government also showed inaction towards the Kalenjin warriors. Moi’s government hoped that the violence would subside by 1993, but in December 1993, fresh clashes erupted in Molo area when Kalenjins invaded farms owned by Kikuyus and Kisiis. In 1994, clashes in Nakuru District (and Molo division in particular) continued unabated; and retaliatory raids were conducted against Kalenjins. Interestingly, Kalenjin military officers and police officers were implicated in organizing and coordinating some of the raids by the Kalenjin warriors, a fact revealed when defensive battles killed some of the Kalenjin raiders, whose identity – as ascertained from their identifications cards or job employment cards - showed that they were security officers still in active service. Nevertheless, Moi’s regime gained from the clashes as the political hegemony of the Kalenjin was consolidated in the region, as the evicted masses were unable to vote thus ensuring that the Rift Valley bloc was dominated by KANU. Kalenjin interlopers were also allowed to possess the land and properties left behind by the displaced, thus allowing them (the interlopers) to be economically empowered. It is estimated that at least 1,500 people were killed during the 1992-1993 tribal clashes, and at least 300,000 displaced. In 1997, tribal clashes erupted again when Kalenjin Warriors raided non-Kalenjin owned farms in Nakuru district. However, defensive measures and retaliatory raids by the Kikuyu community inflicted massive losses on the Kalenjin attackers. Also in 1997, ethnic clashes erupted in Mombasa - with its epicenter being Likoni area, an opposition stronghold within the sea of KANU-held areas. The results were disastrous. The massive disruptions caused by the ethnic clashes serve to reveal the dangers of Ethno-terrorism. Ethno-terrorism allows an ethnic group to accumulate disproportionate political power, as well as project it, or leverage it, at opportune moments. Likewise, unconstrained ethno-terrorism nurtures erosion of national integrity, besides fomenting indigenous terrorist campaigns. Accordingly, corrosion of the state structure allows certain ethnic groups to amass the political goods at the expense of other communities, thus laying down the foundation for politically-motivated ethnic violence and state collapse - especially if the ruling government loses popular legitimacy. In unstable theaters of actions, violence remains the most alluring avenue for achieving political goals. This way ethno-terrorism fuels disintegration of the state. Ethno-terrorism linked to group grievances may also intermingle with transnational violent campaigns, as Kenya has agonizingly learnt from the present Al-Shabaab terror campaign inside Kenya. One of Kenya’s pre-eminent historians, Eisha Stephen Atieno Odhiambo, comprehensively described the Ideology of Order that informs the policies and practices of the government of Kenya since independence (and according to the author, till now). According to Odhiambo, the Kenyan government has displayed remarkable fixation with upholding stability and national order as a prerequisite for national development and economic growth. Accordingly, the Kenyan government has used the mantra of political order to rationalize human rights abuses, suppression of political dissension, and oppression of non-pliant minorities. This has also allowed the government to market Kenya as an Oasis of Stability, even though order is derived from a managed democracy and tenuous enforcement of the Bill of Rights. In the Muslim-dominated regions of North-Eastern and Coastal Kenya, systematic marginalization, corruption, and a culture of impunity operated in concert to create a horde of disaffected youth who questioned not only the legitimacy of the state, but also the very existence of Kenya’s sovereignty. At the coast, some banded and formed the secessionist Mombasa Republican Council, while others sought refuge in Radical Islam. Some emigrated to Somalia where they joined the Somalia-based Al-Qaeda-affiliated Islamist organization, Al-Shabaab, where they were trained as terror operatives and dispatched on missions to infiltrate Kenya and destabilize the home front. Ironically in 1992, Moi’s government allowed the registration of thousands of Somalia refugees as Kenyan voters in the hope of tilting the electoral scales in KANU’s favour. Also in 1992, a figure that came to haunt Kenya more than a decade later was also rigged out of his election victory. This happened as the government struggled to deflate Islam revivalism in Mombasa. The name of the failed political aspirant is Aboud Rogo. Presently, Kenya is dealing with the blowbacks and ramifications of the malevolent machinations and blunders of Moi’s Era. Al-Shabaab has subjected the Kenyan government to national embarrassment by conducting sustained attacks, such as the Lamu terror campaign of 2014, which saw violent Islamists carve out a section of Boni Forest as their territory thereby eroding the sovereignty of Kenya. During the Lamu attacks, the terrorists targeted upcountry people whom they viewed as interlopers implanted in the area by the political elite from Central Kenya. In October 2011, the Kenyan Government invaded Somalia under the auspices of Operation Linda Nchi – whose stated goal was to degrade and destroy Al-Shabaab in its home territory. However, the present reality shows that Al-Shabaab has not degraded, but is even now more emboldened - as attested by its recent raids against AMISOM and the mediocre “Government of Somalia”. Moreover, it has also managed to export its terror campaign into Kenya, where it has morphed into a domestic insurgency in Lamu and Garissa counties, thus obliging the Kenyan government to launch Operation Linda Boni to expel Al-Shabaab out of the territories the terrorists control inside Kenya. In 2012, Abu Osama al-Kenyi – one of the Al-Shabaab’s strategists – formulated the strategy of weakening nations fighting against Al-Shabaab by attacking them and dragging them into costly wars of attrition, as well as widening the existing cleavages within such nations. Al-Kenyi (a Kenyan national) reasoned that by weakening such nations, they will neither be able to sustain their operations against Al-Shabaab, nor be able to assist the weak Somalia National Government (which is qualitatively inferior to Al-Shabaab). In these conditions, Al-Shabaab’s ascendancy will allow Al-Qaeda to seed the region with its toxic ideology, besides provoking a regional conflagration. Central to al-Kenyi’s strategy is the utility of ethno-terrorism to pre-empt a cohesive, coherent and unified response to the Islamist threat. With Kenya presently paralyzed by a weakened economy and intensified ethnic polarization, it remains to be seen whether ethno-terrorism will imperil the nation’s guard against the more potent threat posed by Islamist terrorism; or whether the Kikuyu-dominated regime will continue its policies - which embodies their preference of injustice over disorder - as it strives to consolidate the instruments of power so as to guarantee the survival of a predatory state during the 2017 post-election turbulence. Barkley, Blake Edward (2015). “The Last Vestiges of Statehood: Failed States and the Groups that Work within them”. Journal of Military and Strategic Studies 16:2 [Centre of Military and Strategic Studies, 2015]. Rotberg, Robert (2004). When States Fail: Causes and Consequences. Princeton: Princeton University Press. Elischer, Sebastian (2008). Ethnic Coalitions of Convenience and Commitment: Political Parties and Party Systems in Kenya. German Institute of Global and Area Studies (GIGA) Working Papers, Number 68. Hornsby, Charles (2013). Kenya: A History since Independence. IB Tauris. Branch, Daniel (2012). Kenya: Between Hope and Despair, 1963–2011. New Haven: Yale University Press. Sharma, Serena (2015). The 2007–8 Post-election Crisis in Kenya. The Responsibility to Prevent: Overcoming the Challenges of Atrocity Prevention, 280. Hansen, Thomas Obel (2009). Political Violence in Kenya: A Study of Causes, Responses, and a Framework for Discussing Preventive Action. Institute for Security Studies (ISS): ISS Paper 205. Oyugi, Walter (2000). Politicised Ethnic Conflict in Kenya: A Periodic Phenomenon; p.6. Africa Watch (1993). 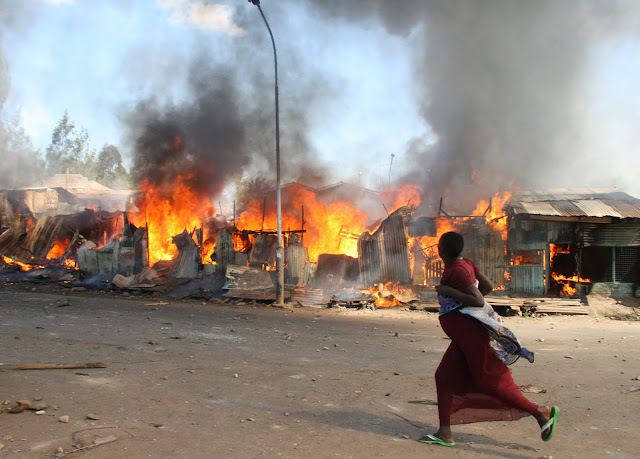 Divide and Rule: State-Sponsored Ethnic Violence in Kenya. New York: Human Rights Watch. Akiwumi, Augustus Molade (1999). Report of the Judicial Commission appointed to inquire into tribal clashes in Kenya. The Commission. Glazzard, Andrew, Sasha Jesperson, and Tom Maguire (2015). Conflict and Countering Violent Extremism: Case Studies. Throup, David, and Charles Hornsby (1998). Multi-Party Politics in Kenya: The Kenyatta & Moi States & the Triumph of the System In The 1992 Election. Ohio University Press. Oded, Aryeh (2000). Islam and Politics in Kenya. Lynne Rienner Publishers. Anderson, David (2014). Why Mpeketoni matters: al-Shabaab and violence in Kenya. Noref Policy Brief, Norwegian Peacebuilding Resource Center. Anderson, David M., and Jacob McKnight (2015). Kenya at war: Al-Shabaab and its enemies in Eastern Africa. African Affairs, 114(454), 1-27. Critical Threats (October 9, 2015). Gulf of Aden Security Review. Agbiboa, Daniel (2014). Terrorism without Borders: Somalia’s Al-Shabaab and the global jihad network. Journal of Terrorism Research, 5(1).